iMonk: Who is the iMonk? Bhakti Lalita Akinchan Maharaj abruptly quit his lucrative Silicon Valley job as a Network Administrator and Webmaster for the biggest Internet networking company in the world, gave away most of his possessions, and went to West Bengal, India, to become a sannyasi — an itinerant monk — in March 2003. 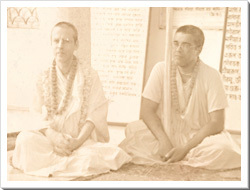 He was accepted as a sannyas disciple, and received the sannyas mantra from His Divine Grace Om Vishnupad Srila Bhakti Sundar Govinda Dev-Goswami Maharaj on March 19th, during the celebration of the Gaura Purnima festival at the worldwide headquarters of the Sri Chaitanya Saraswat Math on the banks of the sacred Ganges River in Sri Nabadwip Dham — and thus became the first South African citizen to become a swami: a tridandi-sannyas mendicant monk. Akinchan Maharaj was born in Durban, South Africa, in 1953. He became interested in Krishna consciousness after reading Bhagavad Gita — As It Is by Srila A.C. Bhaktivedanta Swami Maharaj Prabhupad in October 1981. After searching for a guru for two years, Akinchan Maharaj became a disciple of His Divine Grace Om Vishnupad Srila Bhakti Rakshak Sridhar Dev-Goswami Maharaj when he received harinama initiation, and the name Lalita Charan Das, in September of 1983. 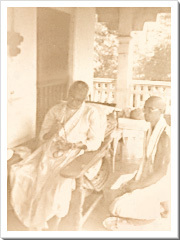 A month later, he traveled to the Sri Chaitanya Saraswat Math in Nabadwip to attend Srila Sridhar Maharaj's Vyasa Puja, and he received second initiation (diksha) from His Divine Grace in October. 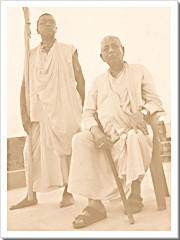 While he was in Nabadwip, Akinchan Maharaj met His Holiness Sripad Bhakti Sudhir Goswami Maharaj, who invited him to the U.S.A. to work on the layout of the Golden Volcano of Divine Love and other books by Srila Sridhar Maharaj, published at the Guardian of Devotion Press in San Jose, California. He lived and worked in San Jose from 1984 to 2003.